Khan Muhammad Shaikh Sindhi Dastan Music Singer. He was most popular Sindhi Dastan Music Artist. 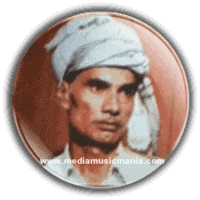 He was legendary Artist of Sindh, He was sung most popular "Sindhi Kalaam's", Dastan Music, Classical great songs in different languages such as Sindhi and Urdu. He was sung Sindhi Folk Music with great style of different sur and he sung lot of Sindhi poets specially he sung "Hazrat Shah Abdul Latif Bhitai R.A", "Hazrat Sachal Sermast R.A", "Hazrat Sahib Dino Shah" and others. Sindhi Dastan Music Singer Khan Muhammad Shaikh was great singer of Sindhi Classical Music. Khan Muhammad Shaikh was very great name in old Sindhi Folk Music. He Played Sindhi Lok Dastan with efficiently and his great sweet sound and specially in new style, he was first singer of Sindhi Music he sung Dastan with great musical Technics. What a stylish singer Khan Muhammad Shaikh, we remember in our heart all time. Sindhi Old Music listeners like Khan Muhammad Shaikh. Khan Muhammad Shaikh sung Lok Dastan like, "Sohni Mahiwal", "Sassi Puno", "Hazrat Yousuf Zulekhan", "Dastan Hazrat Younus A.S", "Dastan Hazrat Baba Bulle Shah" and others was very popular in all over Sindh. His singing style takes place in a live setting, perhaps at an open air "Mehfil" in "Aotaq" and he played also in Mela and marriage Ceremonies. He introduced lok Dastan playing style in Sindh, his song with a spot of wonderfully communicative. This man is a natural storyteller and he sung a song with story telling. Khan Muhammad Shaikh is performed in Sindhi Dastan Music and his music distributed from one village to next village. Shaikh Sahib providing late evening performances for rural and small towns with audiences.